The outdoor wall light Toulouse in the shape of antique lantern made of copper coloured powder-coated aluminium and slightly tinted glass looks beautiful on old buildings or rustic style buildings. Through the slightly tinted although clear glass, it illuminates its surrounding bright and securely. The mounting plate has a length of 83 mm and a diameter of 34 mm. Is this product prone to rust? If you reside close to the coast, then yes. 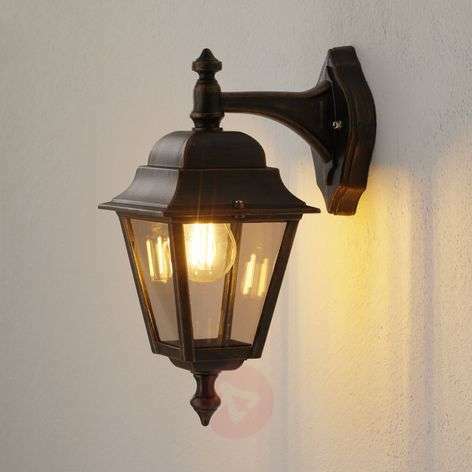 I would recommend for you to have a look at our corrosion resistant light fittings. As an alternative, please have a look at item numbers 3048414 / 6515234.